Winners will be chosen based on number of entries through random drawing. Receive More Entries by Following & Tagging Nashville Flyboard with #NashFlyboardContest on Instagram, Facebook, & Twitter. Each Follow & Tag or Share will be counted as two entries for up to 6 Chances to Win! Submit an Entry at the Nashville Boat & Sport Show at Music City Convention Center, January 6-10, 2016, Nashville FlyBoard, LLC Booth #333 – Counts as 4 Extra Submissions for a Total of 10 Entries. Winners will be announced on our Blog & Social Media on 2-19-2016. Winner(s) will be selected from Social Media follows & tags or shares, plus additional entries submitted at the Nashville Boat & Sport Show. 1 subission must be entered at the Nashville Boat & Sport Show to qualify to win the Grand Prize of a Half Day Party with Nashville FlyBoard. Follow Nashville FlyBoard & share Contest Photo with tag #NashFlyboardContest on social media sites Facebook, Instagram & Twitter. Participants are responsible for checking announcements on nashvilleflyboard.com’s Blog regarding contest and winners. All winners will be subject to Nashville FlyBoard Terms & Conditions, found at https://www.nashvilleflyboard.com/booking#bookings-terms. Participants must meet age, weight, & physical requirements. Grand Prize Winner: Must have a total of 4 entry submissions to win, and will have submitted 1 entry through the Nashville Boat & Sport Show at the Music City Convention Center, which will take place on January 7-10, 2016 at the Music City Convention Center, Booth #333. 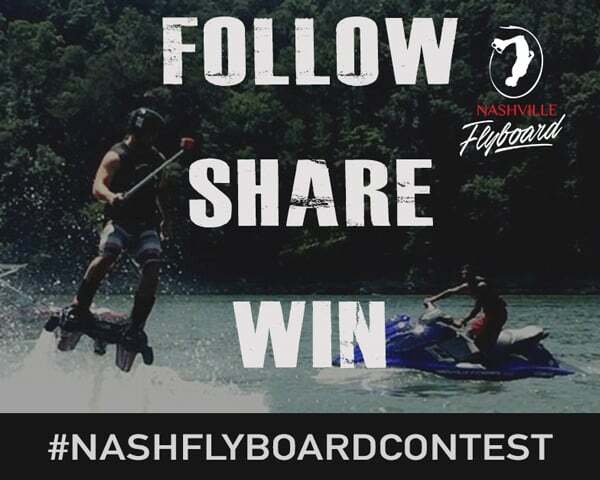 Following Nashville FlyBoard, and sharing our Contest photo with tag #NashFlyboardContest on all Social media platforms, Facebook, Twitter, & Instagram, will count as 3 additional entries. The Half-Day (4 hour) session for 6 people includes the Combo of FlyBoard, Hoverboard, & JetPack, and all equipment required for session. Winners must meet requirements in Nashville FlyBoard’s terms & conditions. Nashville FlyBoard will meet at specific time and date (TBD) at the winner’s lake of choice. All participants and/or winners must meet age, weight, and physical requirements. Runners up will have at least 6 entries Received By followed Nashville FlyBoard & shared Nashville FlyBoard’s Contest Photo with tag #NashFlyboardContest on all three social media platforms, Facebook, Instagram, and Twitter. The 30-minute Nashville FlyBoard Session includes choice of FlyBoard, Hoverboard, or JetPack, and all equipment necessary. Winners must meet requirements in Nashville FlyBoard’s terms & conditions. Nashville FlyBoard will meet at specific time and date (TBD) at the winner’s lake of choice. All participants and/or winners must meet age, weight, and physical requirements. Session Availability: Winners will schedule their session with Nashville FlyBoard based on availabilities of Nashville FlyBoard. We to accommodate the winner’s request for time and date, but makes no guarantees of dates available. If Nashville FlyBoard is not available for dates requested by the winner (s), Nashville FlyBoard will allow a maximum of 3 dates for the winner (s) to choose throughout the 2016 season, winners must be available for one of 3 dates to claim prize, and participate in the NF Sessions. Terms & Conditions Subject to Change. Check Back For Updates.